The key to dry blasting is that the finish is produced by force of media impact, unlike wetblasting which is through flow of water. 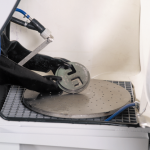 Dry blast cabinets use compressed air to propel blast abrasive directly towards components through the blast nozzle of the gun. All blasting of components is carried out in a secure cabinet, where dust is collected by an integral heavy duty dust extractor. 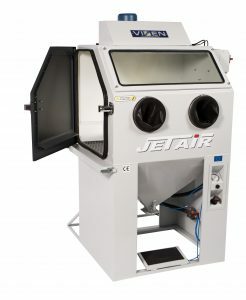 Dry blast machines fall into one of two categories, suction blast cabinets or pressure blast cabinets. Suction blast cabinets are suitable for most industrial applications. The cabinet operates by sucking blast media into the gun body from the hopper of the cabinet via a pickup pipe connected to the blast gun. 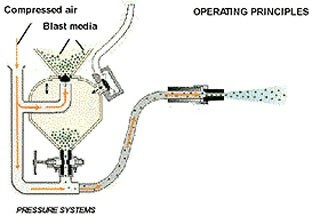 The media is then picked up by a fast moving air stream inside the blast gun and forced out of the blast nozzle. A suction blast system can operate continuously without shutdowns to refill media and can be easily automated with multiple gun bodies. ‘Siphon blast’ is a term used to describe the type of abrasive delivery system used on an abrasive blasting cabinet. A siphon machine uses an injection gun to create suction on the abrasive supply hose, which then conveys the abrasive, using suction or siphon, to the gun where the compressed air hose is used to accelerate the abrasive. 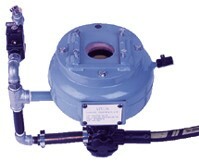 Siphon machines are the most common type of blast machine, which include two hoses on the abrasive blast gun assembly. 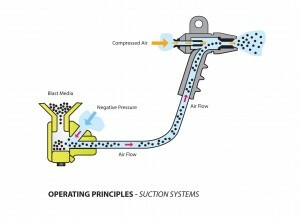 The siphon gun assemblies include an air jet used to create the siphoning effect and establish the amount of compressed air required to operate the machine. Pressure blast cabinets are typically used in high production/large volume output applications. 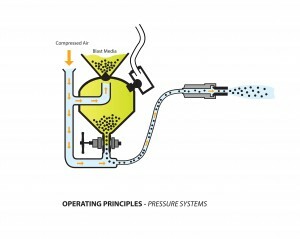 Pressure blast systems utilize a pressure pot, which accelerates media from the pot through the blast hose to the nozzle when pressure is applied. Pressure systems are highly efficient and can increase speed by up to 4 times that of a standard suction system. Direct pressure blast machines use a pressure vessel to pneumatically push the blast media through a single abrasive hose and out of the blast nozzle. These machines are capable of operation with heavy abrasive, steel shot or grit, in addition to most other abrasive blast types and sizes. The cyclone media separator provides a very effective solution for applications where it is important to have a high degree of control over the separation of dust and fine particles from good reusable media, during the blasting process. Media, dust and fine particles are drawn from the blast cabinet and enter the top of the cyclone. The heavier re-usable media is forced to the outer walls by the vortex created, whilst dust and fine particles are drawn to the dust extractor from the centre of the cyclone. The internal side walls of the blast chamber are lined with heavy duty rubber to protect the cabinet from media during the blasting process. A hand held foot controlled light weight blast gun complete with a high quality tungsten carbide nozzle is fitted within the blast chamber. The media is stored in a pressure vessel and activated by pressing the foot pedal. 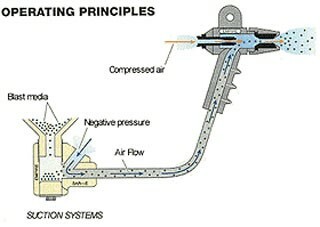 Once the media is pressurised it is forced up through the blast hose to the hand held nozzle at the regulated velocity. 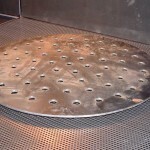 where it is propelled onto the surface of the component to be treated. The media then falls back to the hopper and is recycled. 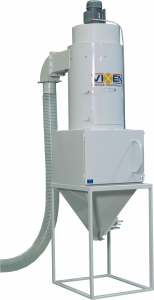 Dust extractors are available in many different forms.